Abortion. It’s a word that historically has not been spoken very loudly, but rather quietly murmured from one woman to the next. Over the years, however, these murmurs have turned into yells; women have demanded and continue to demand that their voices are heard. Those voices were what that encouraged me to add my own. 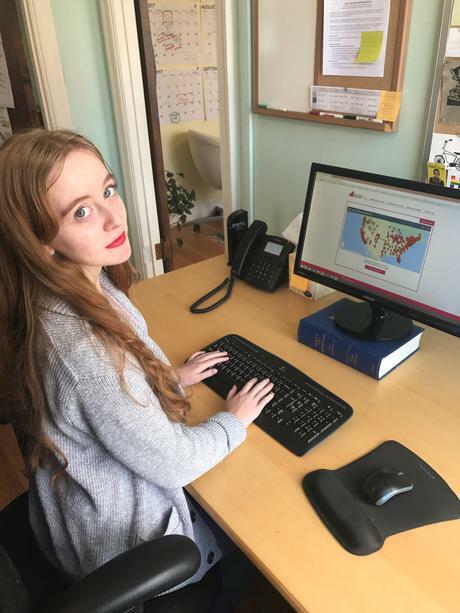 I have always had a strong passion for women’s rights, and when I got the opportunity to intern at the organization Legal Voice, I knew I’d found the perfect place to foster it. The staff of Legal Voice talked about abortion in terms I hadn’t heard it discussed before. At Legal Voice, abortion was spoken about loudly and clearly. I was intrigued and wanted to contribute to that conversation. My research revealed that women are unaware of many of the barriers they have to face to receive abortion care. One major barrier they frequently find is the inability to actually reach a clinic. There are many states in which there are so few clinics that patients have to travel upwards of three hours just to reach the nearest one. If that wasn’t enough, currently 27 states have a 24-hour waiting period, which means patients must go in 24 hours prior to their appointment and receive state-mandated counseling about the procedure before going in for the procedure the following day. I realized I could help address this by helping women find abortion clinics near them. Two years ago, in my junior year of high school, I created a rough Google map pinpointing abortion clinics across the country. By my senior year, I recognized that it’s important not only to take on abortion accessibility, but to also show women what potential challenges they could face in trying to receive an abortion. Yet, despite this need, I also saw how abortion clinics and funds for abortion were only dwindling. After many weeks of brainstorming, I realized that the best possible way to present all of this information and create a useful resource would be through a website, rather than making my map a public entity. And thus, the idea for The Safe Place Project—a safe, non-biased place for women to access information on abortion care and assess their state’s restrictions—was born. The first few months of working on my project coincided with the election of our current president, who is firmly opposed to abortion. I was afraid that my resource could be used against me and that I could potentially face the violent future that some abortion providers have to face daily. Building a website and compiling all the data was no easy task in and of itself either. There were days where I wanted to give up, but I didn’t. I ultimately decided to give up those fears and released my project on May 12 of this year. I have received an immense amount of positive feedback, and I have also been called names and been told my work is the work of the devil. I don’t believe those comments will stop, either. But if my website can help women access information about abortion care, then my work here is done. If my website will help even one woman, it will all have been worth it. I will gladly stand guard at the gate for a new future, one where women do not have to fear discussing abortion and where reproductive health care is not a topic of taboo.